Anita Devasahayam of Trinetizen Media has written a case study about WWF Malaysia for the latest Social Space magazine, produced by the Lien Centre for Social Innovation, Singapore Management University. The paper focuses on the non-profit’s use of media tools to champion its advocacy efforts. The Malaysia chapter of the World Wide Fund for Nature (WWF-M), like most non-profits, operates on tight resources and struggles to gain attention for the work it does. It must contend with issues of relevance, credibility and strategic use of media to deliver its conservation message in a world saturated with media messages. WWF-M currently runs over 70 projects ranging from saving endangered tiger and turtle species, to protecting the highland forests, rivers and seas. The projects are funded through a combination of grants, donations, sponsorships and fund-raisers. Although WWF-M had the support of big brand names such as Boh Plantations, Honda Malaysia and HSBC Bank Malaysia, there were concerns that the projects did not receive sufficient media coverage and were not reaching the desired audience – namely, the larger public interested in the environment and ecology. According to its 2009 annual report, corporate sponsors contributed over RM1.91 million in 2009 compared to RM2.15 million in 2008 in financial support to WWF-M, a drop of almost 11 per cent from 2008 to 2009. Conversely, donations from individuals over the same time period rose by 16 percent. Donations from individuals accounted for 38 per cent of the organisation’s total revenue. 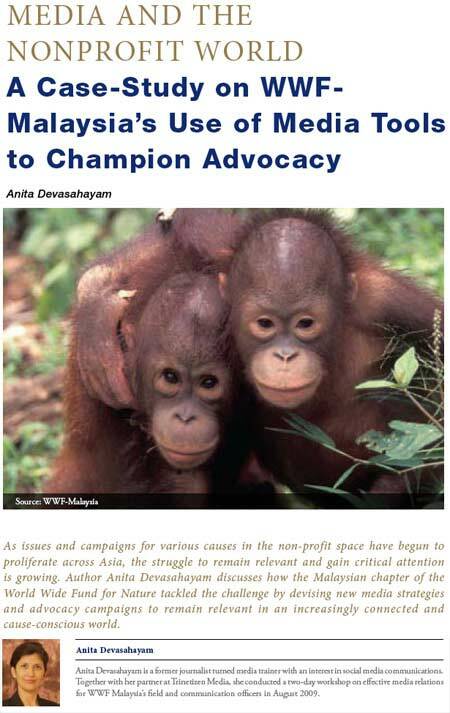 Recognising that a shift had occurred in its source of funding and support and more was needed to engage individual donors from among the Malaysian public, WWF-M was prompted to review their media strategies to meet this objective. Although mainstream media played a significant role in spreading news pertaining to WWF-M’s activities, twice as many articles were written in the media from 2000-2004, as compared to 2005-2009, though there was an overall increase in the number of conservation issues in the latter period. One contributing factor to this change is the general increase in access to the Internet across Malaysia over the last decade. WWF-M recognised that it would have to work with newer media channels, while at the same time coming up with innovative strategies to engage traditional media platforms, to ensure their message reaches the larger public. The results of a survey, targeting senior journalists and editors at local newspapers and broadcast stations, were also eye-opening and gave WWF-M an impetus to change the way they pushed their agenda via the media. The survey identified three key areas that WWF-M needed to address in order to advocate their message of conservation, strengthen their relationship with their current stakeholders and cultivate the larger public in this media saturated environment. ensure that their voice is heard despite the unfavourable media environment. What was perceived as urgent or significant news by WWF-M was not viewed as news by the media. WWF-M’s press releases also tended to be technically complex, with little or no effort to craft the issues in a manner that would be understood by lay-persons. Furthermore, the alarmist tone that often characterized the press releases issued by the organisation did little to increase its credibility, even among reporters who were conversant with conservation issues. Some reporters characterized WWF-M press releases as hyperbolic and occasionally inaccurate. The media stated that it had trouble keeping up with changes in the WWF-M’s communications team. The communications team of the WWF-M also failed to engage with the media on the presumption that the strength of their brand was sufficient to draw attention to the various causes. Mainstream media members generally felt the onus lay with WWF-M to keep editors and journalists apprised of internal changes and new developments. WWF-M was also affected by the economic downturn in the 2008-2009 period. Appeals for donations in the public domain became particularly challenging as a result. WWF-M’s appeals for coverage in broadcast media also revealed that the industry has shifted its emphasis to focus more on poverty, disabilities and unmet social needs. With limited air-time available, conservation and environmental issues were given less coverage through such media platforms. WWF-M needed to work harder to make their issues relevant, timely, and just as important than other matters the media was covering. 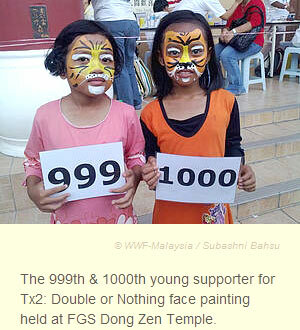 WWF-M’s TX2 tiger conservation campaign used an integrated approach combining offline marketing activities such as tiger-face painting and online appeals and outreach efforts via social networks.